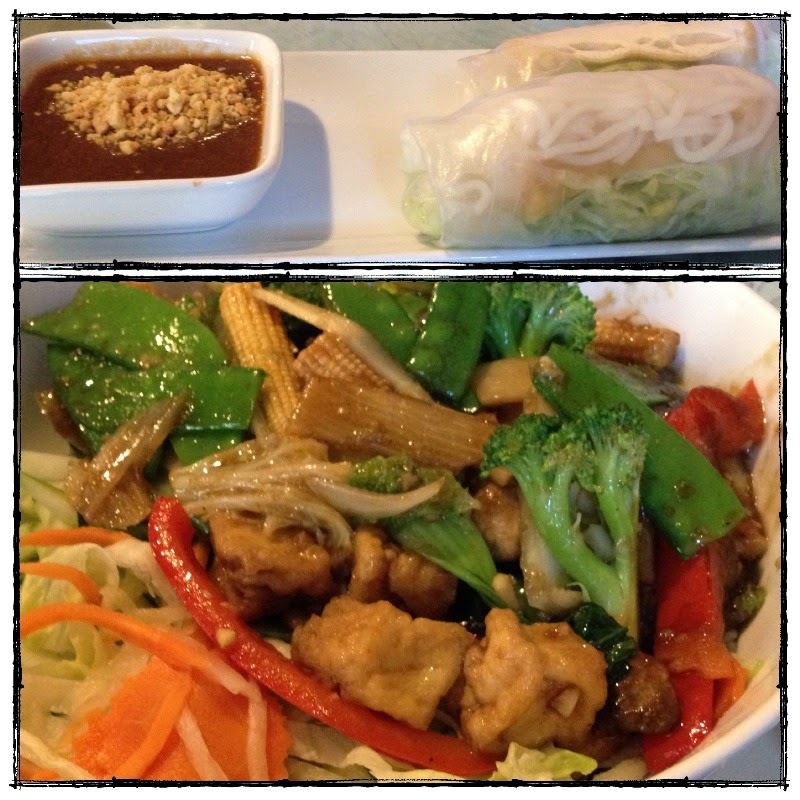 A recent trip to Lac Viet Bistro for summer rolls and bun. Vietnamese restaurants are one of my favorite choices when dining out. Summer rolls are a must, and I rotate between various other dishes when I visit. One of my favorites to re-create in a more healthy way at home is the Bun. 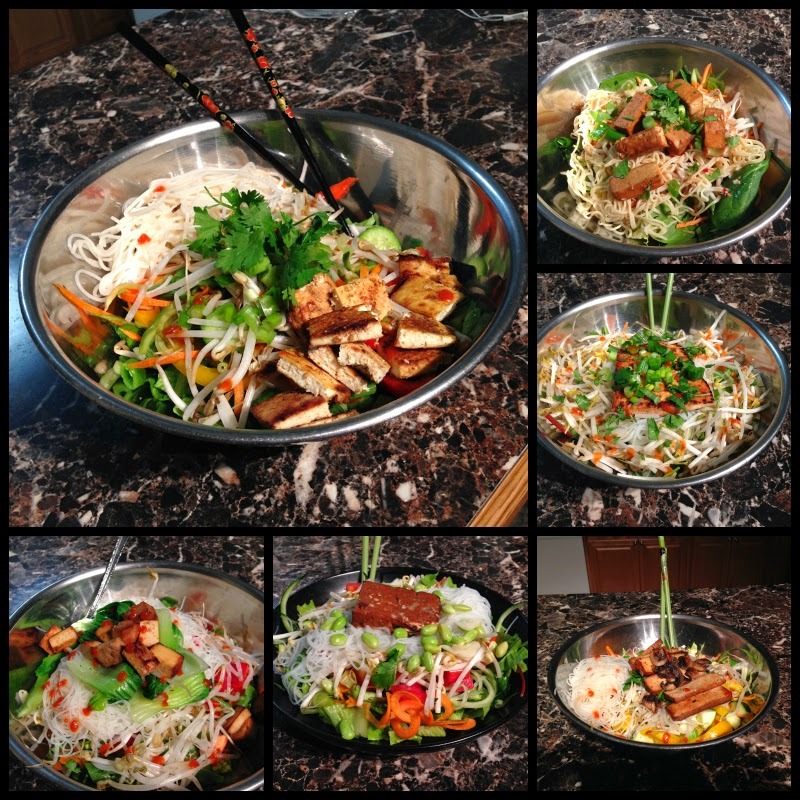 Bun is traditionally a noodle dish with lettuce and other fresh veggies plus cooked meat/tofu/veg. When I make it at home I don't cook with oil and flip the ratio of noodles to lettuce. Combine dressing ingredients in a cruet or container with a lid and shake to combine. Prep your salad base by chopping romaine, cucumber, carrots, pepper, cilantro and scallions. Cook your noodles in salted water. They should only take a few minutes, drain and set aside. Cut your tofu into cubes or slices. Fry in a dry, non-stick pan until browned on at least one side and heated through. Place romaine, cucumber, carrot, pepper and bean sprouts in your bowl. Top with 1/3 of the noodles and 1/3 of the tofu. Garnish with cilantro, scallions, sriracha and nuts to your preference. Drizzle dressing over top to coat. Thank you for sharing this recipe, Carrie! It makes a delicious and filling meal. You're welcome! I'm glad you tried it.